The Rumor: Retina iMacs really are on the way soon, according to some info in Apple's new Xcode 6 program. The Verdict: Looks promising. WWDC came and went without a single hardware announcement, meaning Apple has gone over 8 months without a significant new product. Based on code found in the Yosemite beta, it looks like we won't have to wait much longer for sharper iMacs to land on our desks, thanks to a file that lists scaled-up resolutions for such a display. The structure of the list is identical to resolution listings for the Retina MacBook Pro, making this rumor feel more like a sure-thing now. Apple has today announced a new iMac update which sees the latest fourth-generation Intel quad-core Haswell processors, new graphics, next-generation Wi-Fi, and faster PCIe flash storage options added to the popular all-in-one desktop. The entry-level 21.5-inch iMac now features a 2.7-inch quad-core Intel Core i5 processor and new Iris Pro graphics for “unprecedented levels of integrated graphics performance,” Apple said in its press release. While the high-end 21.5- and 27-inch models now feature the same Core i5 processors with up to 3.4GHz clock speeds and NVIDIA GeForce 700 series graphics with twice the video memory and up to 40% faster performance than the previous models. The iMac can also be upgraded to include faster Intel Core i7 processors at up to 3.5GHz, and NVIDIA GeForce GTX 780M series graphics with up to 4GB of video memory. In addition to these improvements, the new iMacs also support next-generation 802.11ac Wi-Fi — just like Apple’s latest MacBook Air lineup. The new technology delivers wireless performance up to three times faster than that of the previous generation. The new machines also feature support for PCIe-based flash storage, which makes Fusion Drive and all-flash storage options up to 50% faster than the previous models. 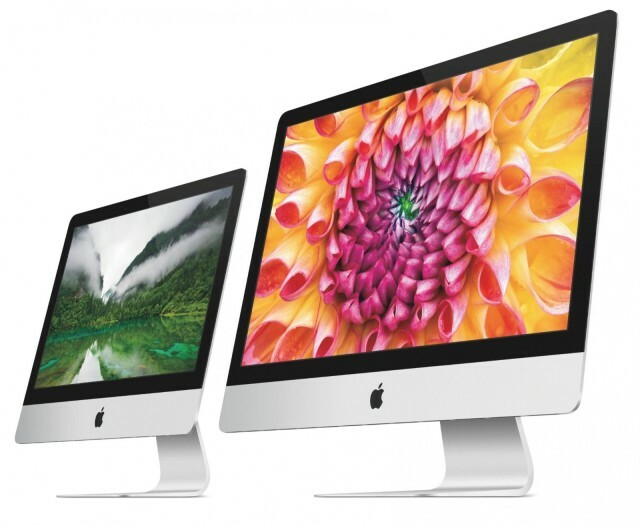 The entry-level 21.5-inch iMac starts at $1,299 in the U.S., while the high-end 21.5-inch model costs $1,499. The larger 27-inch model starts at $1,799, which rises to $1,999 if you add the faster 3.8GHz Core i5 processor and NVIDIA GeForce GTX 775M series graphics. All models are available to order now from the Apple Online Store.